From the lover boy he played in 'Saathiya' to the negative characters he portrayed in 'Company' and 'Shootout at Lokhandwala', he has many a roles to boast about. But Vivek Oberoi has been in the news more for his personal life than his professional achievements. He was the 'Prince' who once ruled the heart of the beauty queen Aishwarya Rai. But, the relationship withered before it could reach full bloom. Vivek was just a few films old when he soured his relations with the Godfather of many - Salman Khan, and this affected his career to a great extent. But as they say, there's light at the end of the tunnel. The previous year has been quite eventful for this charming actor. Besides finding a 'Saathiya' for himself, he seems to be back to the acting world with some meaty roles in his kitty. Vivek celebrated his birthday on 3rd September. On this occasion, Ganesha predicts the actor's year ahead with the help of Vedic astrology. 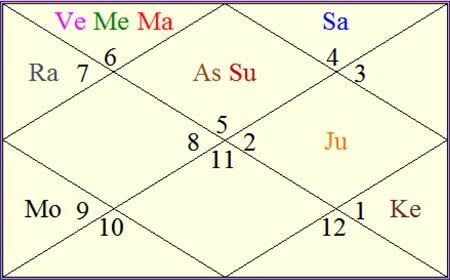 Ketu will be transiting over Natal Jupiter in Vivek's chart, throughout the year ahead. He will be under the influence of Venus return during September 2011. Saturn is currently transiting over Vivek's Natal Mars, Venus and Mercury, but after November 2011, Saturn will be transiting over Natal Saturn. Jupiter is currently transiting over his Natal Ketu, but post May 2012, he will be under the influence of Jupiter return phase. Ganesha strongly feels that Vivek will be pretty busy working on his acting skills during the year ahead. Also, the time is just perfect for him to hone his acting skills. According to Ganesha, he may come up as a much better actor in his forthcoming movies. While Venus return operates in September 2011, he is likely to remain in the limelight, says Ganesha. Post November 2011, his career may change gear. May 2012 onwards, once Jupiter enters Taurus, he may enjoy a great period. During this phase, he may also establish himself as a refined actor, feels Ganesha. One of his films may also become a block-buster during the year ahead, foresees Ganesha.